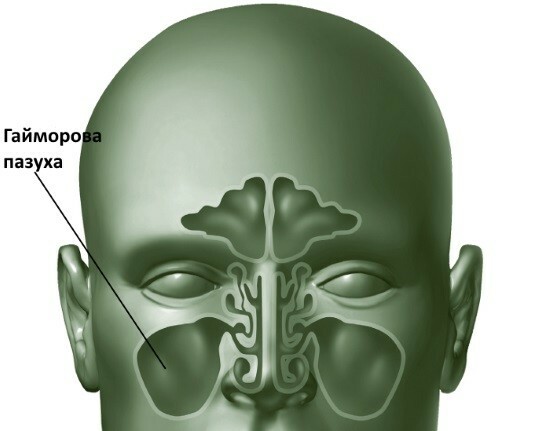 The maxillary sinuses, also called the maxillary, are one of four types of paranasal sinuses. They are the largest and are located in the body of the upper jaw, on the sides of the nasal cavity and communicated with the middle nasal process of the nasal cavity through a fistula. X-ray study of the paranasal sinuses (including, and maxillary) of the nose and currently is a relevant and effective method to determine changes of pneumatization data structures. Violation of the integrity of the sinuses. X-ray picture due to the displacement of bony structures surrounding the sinuses. The radiologist defines the line of fracture, the bone status before and after matching of fragments. Acute inflammation of the maxillary sinus (sinusitis). The obtained x-ray on the walls of the sinus visible band blackout. With time and progression of the process, the intensity of darkening is enhanced by increasing mucosal edema and accumulation of fluid in the cavity of the sinus. With chronic sinusitis (particularly sinusitis) are rendered distinct dimming near the edges of the sinuses. The edges of the shadows, facing the cavity of the sinus is most often uneven, but clear. Polypoid sinusitis is characterized by irregular darkening of the wall on the background of the compromised shape of the lumen of okolonosovyh sinus. Cysts are defined as the formation of oval or rounded shape, attached to one of the walls of the sinus. To exclude odontogenic nature of the cyst, additionally a radiographic study of teeth. Benign and malignant neoplasms. In the pictures you can see shadows of different shapes and outlines. The outline can be smooth or bumpy. Depending on the origin of the tumor, there is a different density of visible structures. X-ray examination does not require special training, it is conducted in a direct front and side projections. 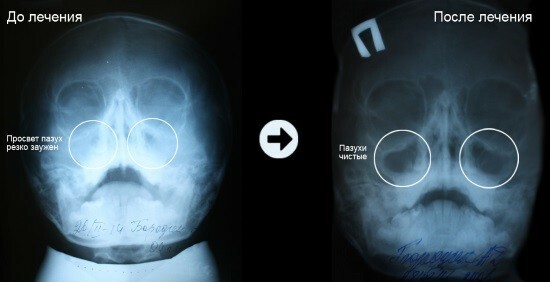 On x-ray was normal sinus represent enlightenment, in the direct projection ─ resembling a triangle, the lateral ─ quadrangle. Radiation exposure is about 0.05 mSv. 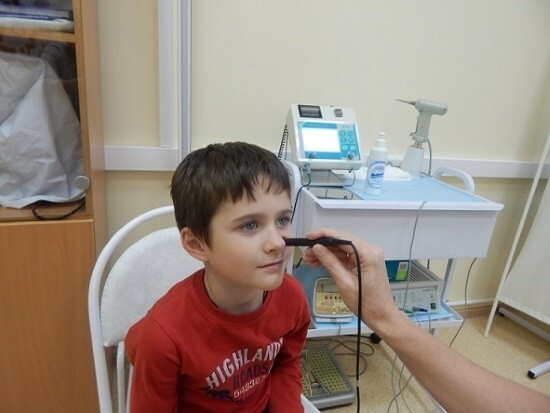 To conduct research can get directions from their otolaryngologist in the outpatient clinic and in private almost every private medical centre with x-ray machine. Radiography ─ the most common and cost-effective way to learn how to look paranasal sinuses, in what condition they are. A special role in modern medicine plays imaging (CT and MRI). It helps to better define the extent and intensity of lesions of the maxillary sinus, as well as to better assess the condition of the soft tissues and cavities of the nose. The imaging is necessary if the patient is prepared for surgery. The methodology of the study of the paranasal sinuses, in maxillary sinus contrast medium injected through a puncture of the outer wall of the nasal cavity in the lower nasal cavity. Next is the x-ray. Therefore carry out differential diagnostics of polyps, cysts and tumors in the absence of a costly scanner. Also in otorhinolaryngology frequently used ultrasound of the sinuses of the nose. In the hands of an experienced specialist ultrasound becomes a powerful tool for diagnosis of various diseases of this localization. If the research is carried out in A mode using ultrasound, it is difficult to distinguish space-occupying lesion of the maxillary sinus and swelling of the mucous or liquid. Also a ultrasound technique does not allow to determine the physical properties of secretions in the sinus. The advantage of using ultrasound in b-mode, unlike A-mode, ─ two-dimensional allows to visualize not only the sinuses, but also surrounding structures and soft tissue. Ultrasound results always coincide with the data obtained by radiography of the maxillary sinuses. According to some specialists, ultrasound method is an alternative to x-ray in the initial diagnosis of sinusitis of the maxillary sinuses. Ultrasound examination is indispensable for the inability to obtain x-ray ─ for example, during pregnancy.